For the impersonator of Field Marshal Bernard Montgomery, see M. E. Clifton James. George Clifton James (May 29, 1920 – April 15, 2017) was an American actor, best known for his roles as Sheriff J.W. Pepper alongside Roger Moore in the James Bond films Live and Let Die (1973) and The Man with the Golden Gun (1974), the sheriff in Silver Streak (1976), a Texas tycoon in The Bad News Bears in Breaking Training (1977), as the owner of the scandalous 1919 Chicago White Sox baseball team in Eight Men Out (1988), and earlier in his acting career as a prison floorwalker in Cool Hand Luke (1967). James was born in Spokane, Washington, the son of Grace (née Dean), a teacher, and Harry James, a journalist. He grew up in Oregon in the Gladstone area of Clackamas County. James was a decorated World War II United States Army veteran. He served as an infantry platoon sergeant with Co. "A" 163rd Inf., 41st Div. He served forty-two months in the South Pacific from January 1942 until August 1945. His decorations include the Silver Star, Bronze Star, and two Purple Hearts. James became well known for playing the comic-relief role of Louisiana Sheriff J.W. Pepper in the James Bond films Live and Let Die (1973) and The Man with the Golden Gun (1974). He also played a very similar character in both Silver Streak (1976) and Superman II (1980), and had a serious role in The Reivers (1969). In that last movie, opposite Steve McQueen, James played a mean, corrupt, bungling country sheriff. James was the district attorney who prosecutes Al Capone in the film The Untouchables (1987). He played a Navy master-at-arms in The Last Detail (1973), starring Jack Nicholson, and Chicago White Sox baseball team owner Charles Comiskey in the true story Eight Men Out (1988), a drama about the corrupt 1919 Chicago White Sox. Despite being a lifelong New Yorker (and an Actors Studio member of long standing), James was cast as a Southerner in many of his roles, such as his appearances in the James Bond films, and as powerful Houston lawyer Striker Bellman in the daytime soap opera Texas from 1981 to 1982. He was a Southern character as the penitentiary's floor-walker in Cool Hand Luke (1967) and as Sheriff Lester Crabb, a temporary one-off replacement for regular Sheriff Rosco P. Coltrane (James Best) in the second season Dukes of Hazzard episode "Treasure of Hazzard" (1980). James appeared on 13 episodes of the sitcom Lewis & Clark in 1981–1982. Other television credits include the 1976 private-eye drama City of Angels and the miniseries Captains and the Kings (1976). He appeared in two episodes of The A-Team: as murderous prison warden Beale in the first-season episode "Pros and Cons" (1983) and as corrupt Sheriff Jake Dawson in the second season's "The White Ballot" (1983). In 1996, he played the role of Red Kilgreen on All My Children. James also played the train passenger Wilkes on the Gunsmoke episode "Snow Train" (1970). His other film roles include those of a wealthy Montana land baron whose cattle are being rustled in Rancho Deluxe (1975) and as the source who tips off a newspaperman to a potentially explosive story in The Bonfire of the Vanities (1990). James was featured a number of times by writer-director John Sayles, including Eight Men Out (1988), Lone Star (1996) and Sunshine State (2002). James' last known film appearance was in Raising Flagg (2006), although he had been cast in a starring role to appear in the feature film Old Soldiers, playing a true-to-life elderly veteran of World War II. Production on that film was halted in 2016. James married twice: to Donna Lea Beach from 1948 to 1950, with whom he had one child, and to Laurie Harper, from 1951 until her death in 2015, with whom he had five children. He resided in Gladstone, Oregon, and died from complications of diabetes on April 15, 2017, aged 96. The Last Detail (1973) as M.A.A. ^ "Clifton James Biography (1921-)". FilmReference.com. Retrieved December 15, 2007. ^ Turnquist, Kristi (April 16, 2017). "Clifton James, veteran of James Bond movies and 'Cool Hand Luke,' dies in Gladstone at 96". The Oregonian/OregonLive. Retrieved April 17, 2017. ^ Ridler, Keith (April 15, 2017). 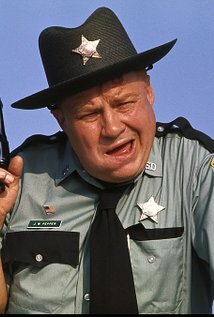 "Clifton James, sheriff in 2 James Bond films, dies at 96". Bluefield Daily Telegraph. Archived from the original on April 17, 2017. Retrieved April 15, 2017. This page is based on the Wikipedia article Clifton James; it is used under the Creative Commons Attribution-ShareAlike 3.0 Unported License (CC-BY-SA). You may redistribute it, verbatim or modified, providing that you comply with the terms of the CC-BY-SA.